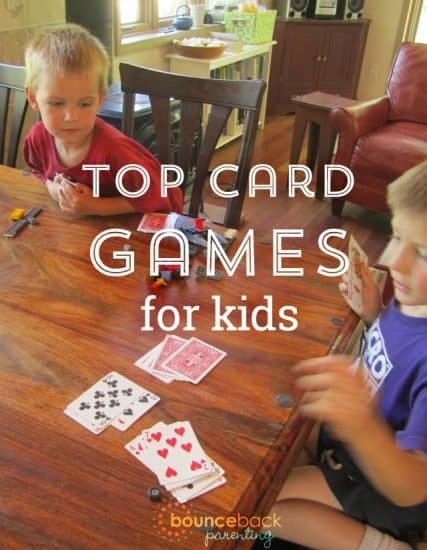 These card games for kids are family favorites – they’re fun for young kids all the way up to grown ups and they’re the perfect quick connection activity with kids. As a mom one of my goals recently is to have a ten minute “Special Time” (one-on-one time) with of my kids each day. You might think ten minutes one-on-one is short and would happen every day naturally, but it doesn’t seem to happen without me making it a priority, and just that short time of concentrated attention is making a big difference for all of our happiness. Playing card games is great for this time as they’re easy to pull out and fun for everyone. 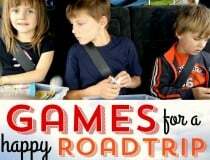 Here are our favorite family card games for young kids. Spot It is a quick matching game – each card has one item in common with each other card, but ONLY one thing. It takes quick eyes to spot the matching items. The game comes with five different ways to play and when you play one on one with your child you can alter the rules as needed to make it enjoyable for them to play. My only issue with playing this game with younger kids is that the version we have (pictured above) has rather odd images. You can learn or make up the names of them (weird hand shape! question mark! target! ), but if I could go back I would buy the version they have out now called Spot It Jr.! Animals which has cute pictures of animals – much easier to recognize than the pictures on the original Spot It cards. Uno – This classic is such a great ten minute game. Kids can start learning it very young and you can play simply at first, just matching colors or learning their numbers. By the time they’re five years old or so, they can play on their own against you, and there’s just enough luck involved that they can win occasionally,even when you play at your best against them. Aquarius is a little like dominoes with cards. 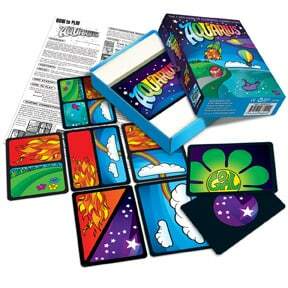 It requires no reading, features colorful cards and quirky rules for play. You might have to help younger kids understand what to goal is, but even if they don’t quite get it, they have fun linking up the cards. 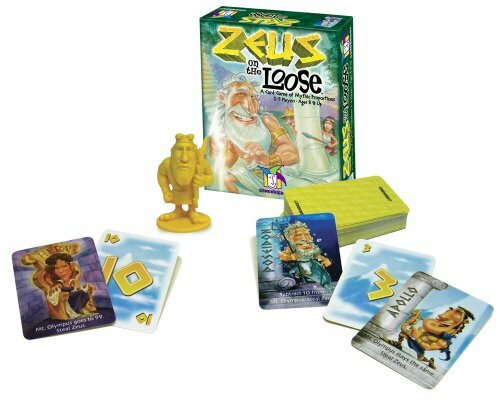 Zeus on the Loose – As we mention in our post about the best math card games and board games, Zeus on the Loose is a great game for building quick addition skills – perfect for kids (and grown ups) ages 8+. It’s also just downright fun,and the rounds go quickly, making it perfect for squeezing in a card game after dinner on a school night. Story cards – We use story cards as story starters, as inspiration for mini books or conversation starters at dinner. 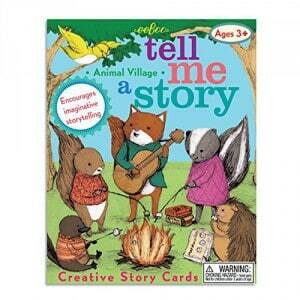 eeBoo has many different sets of story cards available such as: eeBoo Tell Me a Story – Animal Village, which includes instructions for a variety of imaginative games. If rolling dice is more your style you may enjoy Rory’s Story Cubes too. Moose in the House – The goal in this game is to keep the moose out of your house. You can use door cards or set a moose trap and send moose to other players. The mom who recommended it says her kids love it, but she is only down to play a couple rounds. Sleeping Queens – Easy to play and easy to learn, but you still use strategy (and a little luck) to wake up these sleeping queens. Readers recommend the anniversary edition in the tin box for more fun as it has more queens (16), knights, kings, potions, dragons, wands, making for more fun game play. Dragon Wood – Draw Adventure cards and roll dice to make your way through the Dragon Wood. Many reviewers have remarked that if your family has played Sleeping Queens and loves it, this is the next step in games from GameWright. Dragon Wood has a little more complexity, yet is still easy to pick up and fun for kids 6 and up. Kings on the Corner – this card game was a favorite in my husband’s family when he was growing up. Gin Rummy – This is what my grandma taught us when we’d come to visit, might be harder with young kids. 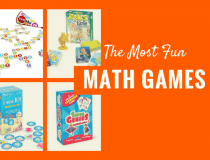 Those are a few of our favorite card games to play with our 5 and 8 year old (the 2 year old also gleefully “plays” when she’s on someone’s team ;)). What else can you recommend? I love having these easy to games for connection time and would be happy to add more. Stephen covey talks about those special times with your kids in his 7 habits of effective families but I remember how it seemed simpler to do than it really was when my kids were little. We love uno, too. Other good ones are phase 10 and skippo! We love Rat-A-Tat Cat by GameWright. Can be played by any child that knows their numbers up to 10 – aim is to get rid of your high scoring rat cards and replace them with low scoring cat cards. Player with the lowest scoring hand wins. Good memory training as well though as your cards stay face down on the table and you are only allowed to peep at a card to see what it is at the start or when you get a peep card. Very quick games. Also Forbidden Island for a family game. This is more like a half hour game, but is nice because it is a co-operative game instead of a competitive one. You all work together to rescue 4 treasures from an ancient island that is sinking into the sea. You either win as a team and get helicoptered off the island together with your treasures or all fail together as the island sinks before you get all the treasures. This style of game can be played by even young children as you are actively supposed to suggest moves to each other and help with strategy. Our 2 year old daughter has joined in this game, though she mostly gets bored and wanders off after 5 minutes or so. Our 5 year old has a good grasp of the rules though. We’ve also just started playing Strip Jack Naked, which is played with a normal pack of cards. Bit tedious for adults, but I remember loving it as a child. I struggle to get any one-to-one time with either of my kids as I work full time and when I’m at home they both desperately want my attention all the time. Would you mind me asking what your other children are doing while you are having special time with one of them? Do you have any suggestions for strategies to get that special time as I think it would help us too. Thanks very much. Thanks so much for your game recommendations Lynda. I’ve seen that Ratatat one by Gamewright and wondered if it’s fun – sounds like we’d like it. I’m working on some posts about one on one time when you have more than one kid, because its something I’m really working on right now. I see it making a big difference with my parenting, but it really is tricky sometimes with multiple children. I’ll get in touch when I’ve got more published on the topic. Thanks Alissa – I’ll look forward to it. My mom taught my daughter Crazy Eights. She loves it. It is pretty much Uno with face cards but she loves it! It is her go to game. Hooray for grandma time! 🙂 Sounds like they’re making some good memories. Don’t forget WAR (with a plain ol’ deck of cards). We fell in love with UNO Moo as our intro to card games. It uses figurines instead of cards so the under four crowd can easily play. Everyone enjoys playing it, young an old. I love your ten minute each idea. I need to make it a priority in my family. Thanks for the idea! We love Old Maid and Go Fish. And sometimes I’ll just pull out the Ace through 10 cards, put them in a pile and have each of my 3 year olds pick one color or suit and put their cards in order or make matches. Thanks for all of these other great ideas! We love playing Dominoes with my 3 year old (has been playing since she was 2 1/2) and she loves it. We haven’t figured out how to use the trains that came with it though. 🙂 We also like Exago & Memory is a favorite (with picture cards). My daughter loves problem solving and puzzles, so thanks for these ideas above. I just ordered a few that I think will be a good fit for us all! Clock Solitaire! Great intro to time-telling and card playing. I made a template on a piece of paper to make set-up easier for my four-year-old. Here is a brief on it. Basically you can make this game yourself. You just need 3 shapes, 3 colours, 3 sizes and 3 backgrounds and make combinations of all these. My kids love Sleeping Queens, also by Gamewright. My children are 8, 5 and 4. Oh, I’ve seen that card game and wondered if it’s any good – thanks for the recommendation. I really like Dixit, and you can use your story cards easily. 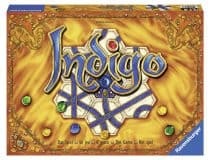 Dixit is usually a 3-4 person game, but we play it with just the 2 of us (or add in a stuffed animal as a third party). My grandkids and I enjoy Cat in the Hat. Fun props and easy to follow pictures for beginning readers. Thanks Rhonda, will take a look at that game. My youngest who was four at the time (prereader) could play Feudal Lords. Great fun! Thanks for the card game ideas! As a parent of one who reads and one that is just learning the alphabet — this is really helpful and fun for both ages. Such a great list! Just curious, what are you recommendations for card games that would be good for young readers? Say, age 6 or 7+? 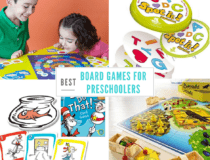 My oldest (age 7) finds some of the picture-only based games a little “too baby” and wants something a little more grown up (that might require reading)…We’ve enjoyed Apples to Apples with the older cousins, but what else would you recommend? Thanks, Alissa! I had heard of Sleeping Queens but not the others. Thanks for the tip!